Divide the class into two teams and play a quick round of Family Feud. See which team can get the most correct answers to this prompt: Name the top 5 best selling soups in America. Click on “Sole’ Soups” to view the answers. After the game, ask students which are their favorites from the list and why. Students will be given access to a Soup Hyper-Slide that contains links to a variety of resources relating to basic soup information. Using the Hyper-Slide, students will work through the soup packet of questions and activities to learn more about soup basics. 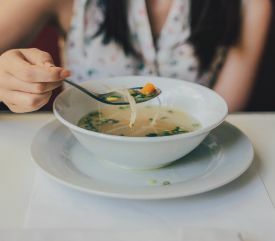 They explore such things as soup history, the different types of soup, the differences between stocks and broths, the steps involved in making different types of soup, garnishes, etiquette in eating soup as well as health benefits. For early finishers or as an extension, students explore global connections of soup. Once students have successfully completed the self-directed activities, I have them prepare two different varieties of soup in the lab; clear and cream. In the clear soup lab, students make a Garden Vegetable Soup by Alton Brown. I show them the demo video prior to the lab so they have a rough idea of what they are doing. In the cream soup lab, students make a Cream of Cauliflower Soup. Surprisingly, many students have never eaten this type of cream soup so it’s a great way to expose them to something new.